The other day I decided to make myself a top, I chose a fairly straight forward pattern with a crossover drape across the front and some lightweight jersey from my stash. I cut it out and then tested a few stitches on my sewing machine, whatever I did it ate the fabric, I tried a flat zigzag, a stretch stitch, different sizes, I had a new jersey needle in the machine but the machine kept stopping ‘for safety reasons’, namely that it was eating the fabric! I tried the overlocker with no more success! In the end I abandoned it and made a skirt instead!! 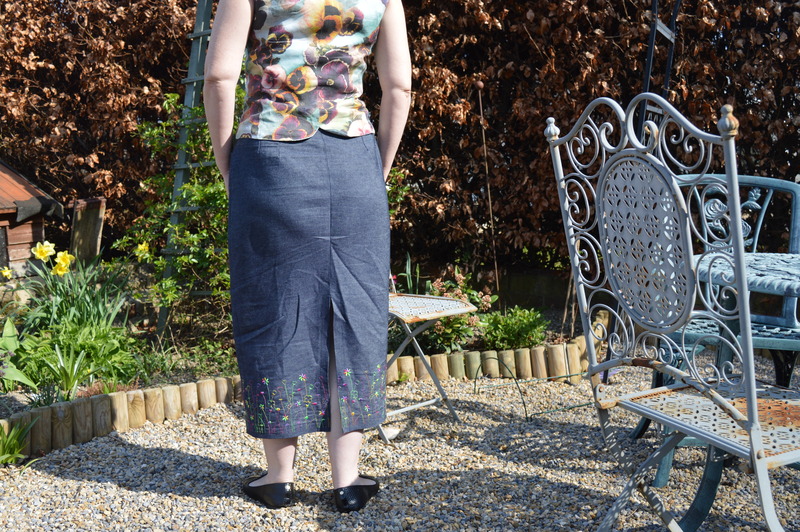 I chose a pattern I picked up from the swap table at the Dewsbury Sewing meet-up, Newlook 6013, it’s just a straight skirt with a button front and a split at the back. I decided it would work in denim. It went together really easily, I chose a snazzy sewing fabric for the inside pocket lining which adds like a secret splash of colour. I lowered the height of the split by about 4″ as I felt it would have barely covered my bottom! The pattern also only used six buttons, as you can see I used about nine as I wanted the slightly closer together and a lot further down! I still haven’t quite mastered the knack of remembering to turn the button the right way up before hammering the back in. I used the keyhole buttonhole stitch on my sewing machine and they’ve come out OK. I made a straight size 14 and I’m pretty pleased with the fit, it’s comfortable to wear and most importantly the buttons stay done up! I was thinking if the embroidery looks a bit bright I could always wash it with a few dark blue towels, but now it’s made up I really like it, it doesn’t look as bright. I still need to make some tops so I need to master jersey sometime soon! 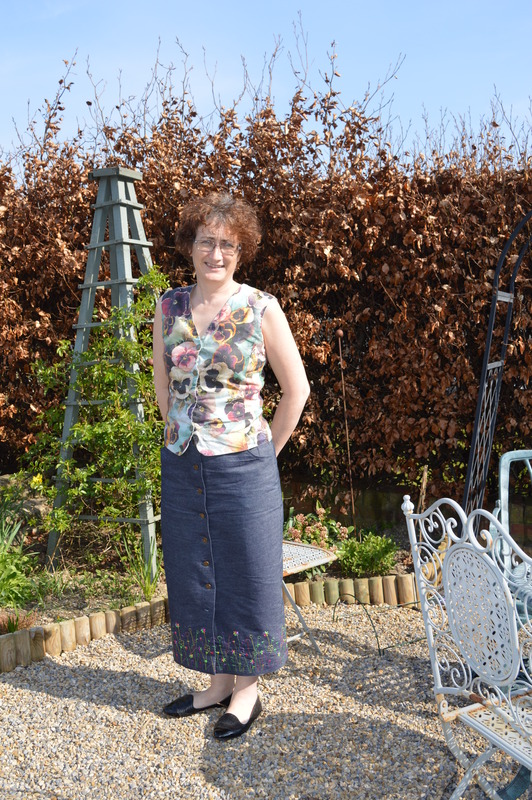 This entry was posted in Dressmaking, Sewing and tagged Denim Skirt, embroidered denim, Newlook 6019. Bookmark the permalink. that’s a lovely skirt, and the embroidery looks great! I’ve just done a second small project with jersey fabric and found loosening upper tension helped make things go more smoothly. I need another play I think! Grand job with the skirt, Margaret – love it! Making the longer skirt version, with the plain denim above the embroidery, must have put it into proper perspective, reckon? That is one cute skirt, Margaret! And I like the top that you are wearing with it, too! I really like that – it’s not overwhelming and it’s unique. 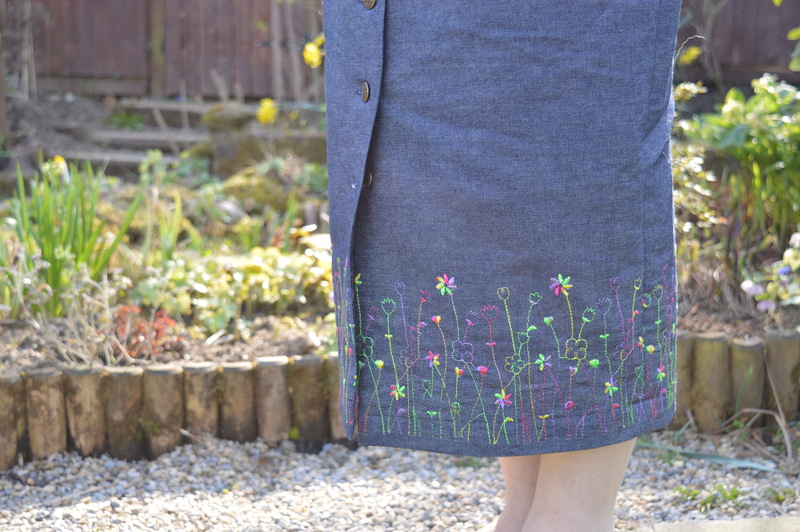 I love the embroidery on that denim, and it is perfect for a denim skirt, just gives it a bit of specialness. I am going to do more knits this year too. Though I’ve done nothing with knit since I made the cardigan. I want to get a basic tank and sleeved pattern that I can use. Love that skirt! Maybe a lightweight stabilizer under the jersey material will help. The skirt, and its embroidery, looks great. The pansy fabric top is lovely too, and they look ewl together. Well done! The pansy print top is perfect with the skirt! I love the embroidery around the hem of the skirt. Good luck with your next attempt with jersey. Oh my goodness that is amazing! I so admire your multiple crafting talents!